Just an FYI---we will be on a 2-week story time break (May 28 to June 8) as we get ready for the summer reading program. We will resume with our story times on Monday June 11th. For a listing of super summer fun at the library, click here! 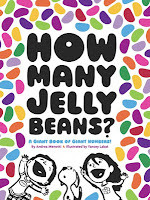 Favorite Book Fridays: How Many Jelly Beans? 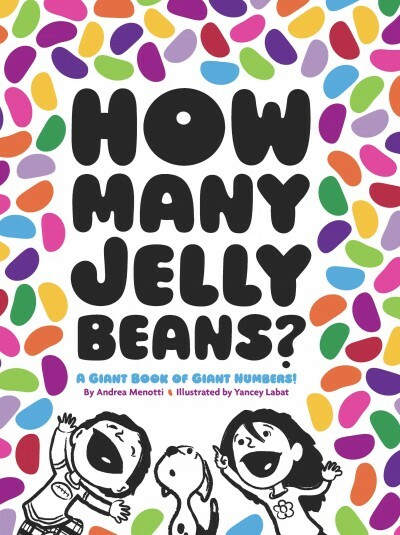 If your kid wants to know what a million looks like, How Many Jelly Beans?, by Andrea Menotti, is a must-see. Most counting books go to 10, and if you're lucky you may read one that counts clear to 20. This book just does away with 1 through 9 altogether and begins with 10. Two bickering kids and a cute little dog guide you clear up to the big ONE-OH-OH-OH-OH-OH-OH-OH-OH-OH. I have just one request for you if you choose to check it out: Be gentle with the gigantic fold-out page! 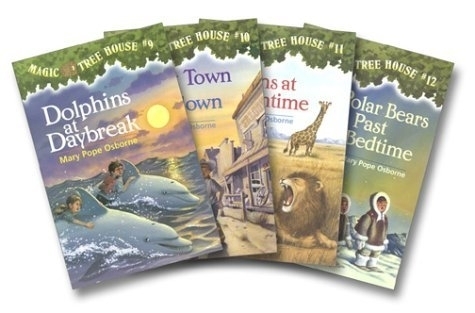 Magic Tree House Turns 20! There seems to be a lot of book bithdays and milestones lately. The latest is that The Magic Tree House Series has turned 20 years old! School Library Journal spoke with the famed series author, Mary Pope Osborne about what libarians mean to her, the impact of her stories on kids, why she thinks the series has endured, and what's in store to celebrate its 20th anniversary. Click here to read the interview. The beloved Newbery Honor Book, Charlotte's Web by E.B. White turns 60 this year! Here's an article about the anniversary from The New York Times along with the centerpiece of E.B. White's barn on his 40 acre farm. PLUS, Kate DiCamillo has made a 2.5 minute video tribute on YouTube in honor of the book. Newbery-winning author and naturalist Jean Craighead George, who inspired many children to pursue careers in the natural sciences, died May 15th in New York. George wrote more than 100 books for young adults, including the popular Newbery Medal-winning Julie of the Wolves. Since writing her first book in 1949, she strived to bring a love of nature to her readers. 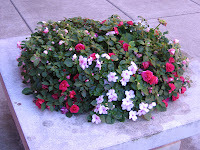 Click here for an obituary from School Library Journal. When I was in graduate school working on my MLIS, in one of my classes we held a Mock Caldecott competition. The books we looked at were all of the Caldecott Honor Books that were awarded within a five year period (at the time). Out of those books, each team in my class had to choose our mock winning title among those books. Zin! Zin! Zin! : A Violin was the winner for my team. I just absolutely love the book with its whimiscal looking musicians (because I'm a musician myself). The coloring is bright and fun while reflecting the movement of music. The book also makes a great introduction to music and musical instruments for youngsters. After reading the book, watch the DVD...as it is just as good, if not better!!! The Friends of the Tigard Library will be sponsoring another book sale! This one will include longer hours and a Sunday sale date! Come visit the sale in the Burgess Community Room for some great sale prices while supporting the Friends and the library! Friday May 18th; 9 a.m. to 5 p.m.
Saturday May 19th; 9 a.m. to 5 p.m.
Sunday May 20th; 11 a.m. to 3 p.m.--Bag Sale!!! SUMMER READING IS ALMOST HERE!!! Lots of peope have been asking, "When does summer reading start?" Well, it is starting soon and we have been very busy getting ready for it. So to answer that popular question, Registration begins JUNE 1st!!! Youth ages birth through age 18 are eligible to participate!!! It's ok if you have a youngster who isn't reading yet...you can just read to them instead! Children who are read to learn important early literacy skills and it gets them prepared for when they do start reading. Kids and teens who already read on their own during the summer will keep their minds active and make them better prepared to start school in the fall. For a sneak peek at what's going on at the library and other Washington Count Libraries this summer: check out the WCCLS summer reading webpage! Join us for our May SUPER TUESDAY Event on May 15th @ 7 p.m. in the Burgess Community Room with the Renegade Stringband! This Northwest bluesgrass band turns hard times into good times!!! Combining banjo, mandolin, bass, guitar, and three-part vocal harmonies, they'll lead the audience in a toe-tappin', hootin', hollerin', and call-and-response sing-along. It's sure to be fun for the whole family!!! Since Maurice Sendak passed away earlier this week, we thought we would honor his memory by sharing some of our fond memories and favorite books that he has written and illustrated during his career. A few of my many favorite Maurice Sendak offerings are the lovely and expressive line drawings that accompany Ruth Krauss's definitions in the books A Hole is to Dig and Open House for Butterflies. Both books are packed to the gills with naughty, and sweet, and imaginitive children exploring their world with delight. I have fond memories of Little Bear from when I was growing up, and now I share Little Bear stories with my little boy, who loves them just as much. For the longest time I thought Maurice Sendak was the author, but he actually is the illustrator. I also thoroughly enjoyed Stephen Colbert's irreverent interview of him on The Colbert Report (Here is Part 2 of that interview). My favorite Maurice Sendak books are the ones from The Nutshell Library. This little series includes the titles One Was Johnny, Alligators All Around, Chicken Soup with Rice, and Pierre. I remember distinctively in grade school when my school librarian had us watch a video (yes, it was VHS!) of the Nutshell gang as they danced around to the vocalized text from the book and accompanying musical background. I loved the catchy tunes, and watching these characters dance around on the screen (especially the alligators and Pierre!). Plus, my family bought the cassette tape with the songs on it from the Scholastic Book Fair...which got a lot of use! Today I own the video with all the animated stories. Our dear Maurice was definitely a man of many interests, though very particular ideals. As he discusses in this 2001 interview with NPR, when he was first approached to come collaborate on a new adaptation and design for Tchaikovsky’s Nutcracker on the Pacific Northwest Ballet’s stage, his initial reaction was to turn down the project, which he perceived as predictable and banal. Then, he looked a little closer at the meat of E.T.A. Hoffman’s original story and discovered a darkness and honesty about the challenges of growing up that suited his aesthetic perfectly. PNW Ballet’s production of Nutcracker, complete with Sendak’s sets and storytelling, premiered in December, 1983, and to this day it remains one of the most famous and beloved versions of this perennial holiday favorite. You can still trek up to Seattle every year to see it! In the meantime, check out the full text E.T.A. Hoffman’s story, enhanced by Sendak’s darkly gorgeous illustrations. Would you like to make your own miniature magnetic masterpiece? Create a bright and fuzzy felt refrigerator ladybug magnet? You could also make your magnetic fishing game or do a little science experiment. It will be a positively fun day with magnets, this Sunday, May 13th. Come join us in the Puett Room from 1:30 p.m. to 2:30 p.m. for all things magnetic. Happy 20th Birthday Junie B. Jones!!! Everyone's favorite Kindergartender, turned First Grader has turned 20 years old! 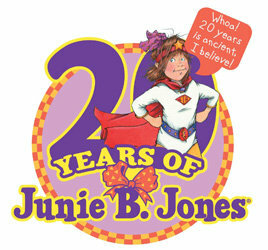 (Well, technically, it's been 20 years since the first Junie B. Jones book was published.) For you die-hard fans out there, Random House is releasing a 20th Anniversary Commemorative Edition of Junie B. Jones and the Stupid Smelly Bus with full-color illustrations and an interview with the author, Barbara Park. For the full story, click here to read the article from Publisher's Weekly. And when you're done, why not read The Stupid Smelly Bus! Our annual Preschool Story Time Courtyard Planting Day will be this week---Thursday May 10th thanks to the sunnier and warmer weather we are having. Please bring your preschool aged child, between ages 3 to 6 at 1:15 p.m. to hear stories about flowers, then take turns planting flowers in the courtyard planters. Each child who plants a flower will mark it with a stake with their name on it so they can watch their plant grow throughout the summer. Kids will also make their own paper flower basket and make their own silk flower arrangement to place in them. It's gonna be flowers galore this thursday at the library!!! The world of children's books has lost a beloved author. Maurice Sendak, best known for Where the Wild Things Are passed away today at the age of 83. For the full story, read this New York Times Article. The library also has a display of his books available for check out, located in the children's room. One of my favorite book characters, Little Nutbrown Hare, from Sam McBratney's Guess How Much I Love You book has made his way over to animation. The Disney Junior channel is now airing "Guess How Much I Love You" weeknights at 8:30 p.m. While I only have basic cable at my house, there's a fun website to go along with the show that contains games, coloring activities, and full episode clips. The website looks like a lot of fun for the preschool and lower elementary school age crowd. May 7-13 is Children's Book Week, which is the national celebration of books and reading for youth, sponsored by the Children's Book Council. Established in 1919, Children's Book Week is the longest-running literacy initiative in the country. Each year, books for young people and the joy of reading are feted for a full week with author and illustrator appearances, storytelling, parties, and other book-related events at schools, libraries, bookstores, museums, and homes from coast to coast! Why not celebrate by checking out the Children's Book Week Website and stopping by the library to check out a great book. Need help finding a great children's book? Youth librarians will be eager to help you choose the right one! I take my reading seriously. I believe that it is my duty to stay current on recently published titles, in case they are worthy of recommending to an enthusiastic, voracious reader, or a reluctant reader for that matter. Recently, I read few titles that leaped out to me as engaging, hard-to-pass-up stories. 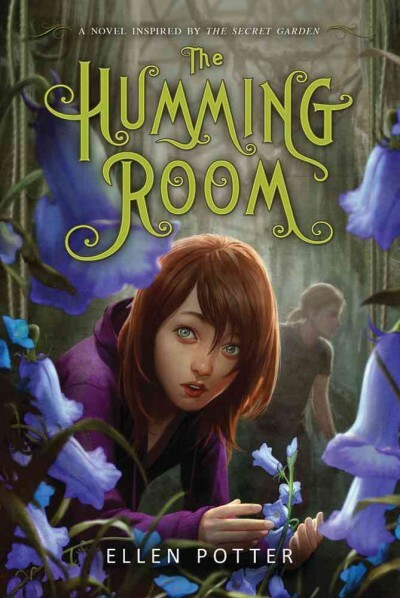 Those of you who loved The Secret Garden might want to pick up The Humming Room by Ellen Potter. This story, that takes place on an island in the middle of the St. Lawrence river, is inspired by Frances Hodgson Burnett's classic. In the new spin, tiny and wild 12-year-old Roo is sent to live in an old children's hospital with an Uncle she's never met. After wandering the deserted halls and investigating strange noises, Roo discovers she has a cousin, too. An out of control, sickly cousin. Equally stubborn, Roo and her cousin Phillip work together towards healing and sprouting new life within themselves and in their environment. And yes, there is a garden, but you'll have to read it to find out more about that. In my favorite books, many characters get a chance to tell their version of the story in their own voice. 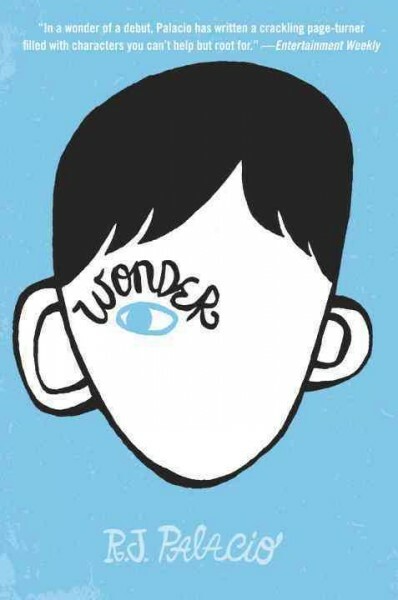 Such is the case with R.J. Palacio's Wonder. First we hear from August Pullman, who is heading to public school for the first time as a fifth grader. Because of severe medical conditions, Auggie's been homeschooled until now. It's a big challenge, considering his facial features are unlike any of his classmates. Just when we get used to August's narrative, we hear from his sister, Via, and what her life has been like as the family member of a kid who has required 27 surgeries and constant attention. Then we hear from classmates and friends of August and Via, expanding the story through their many perspectives, until we can see a complex bigger picture. This book is about accepting extraordinary differences, but it is also about the power of ordinary kindness. 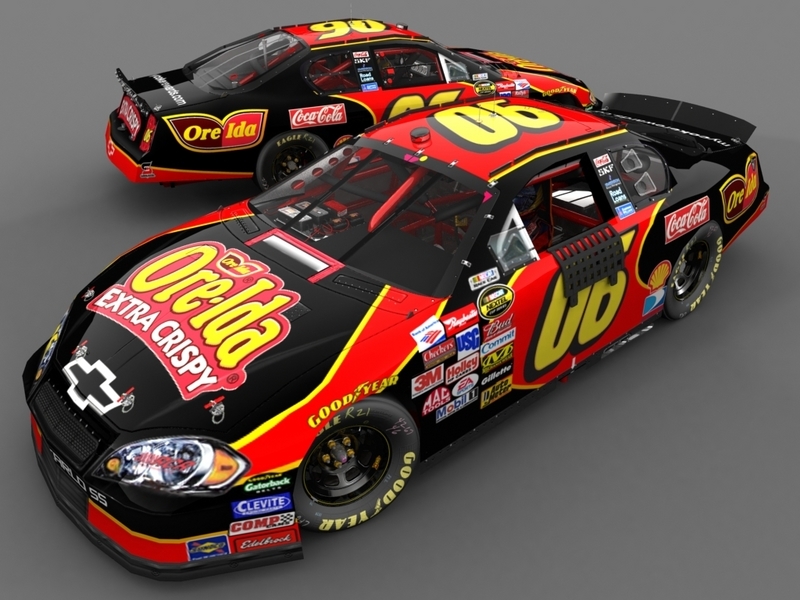 ORCA & BCCCA Winners Announced! Saturday, May 5 * 1:30 - 3 p.m. Create the ultimate race track out of recycled paper tubes, tape and other awesome junk. We'll provide all the materials and customized model race car for each participant!